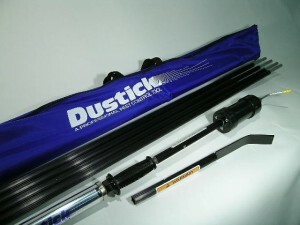 This Dustick Kit includes the Basic Dustick and the optional Scraper Top. The Scraper Top enables one to have an optional attachment which can be used to remove wasp nests and other undesirable things off your house. Options for this include 4 ft Extension Rods and the Aerosol Top. Other Dustick Kits include the Dustick Basic Kit, Dustick w/Aerosol Top Kit and the Dustick Deluxe Kit.